Texas and Pacific Railway Depot in Natchitoches. The construction of the Texas and Pacific Railway Depot in 1927 was the culmination of a social and economic odyssey to bring rail access to Natchitoches. After unwisely turning down inclusion in a rail line in 1881, the citizens of Natchitoches negotiated with at least half a dozen local and regional railroad companies over several decades to build a spur line through the town. 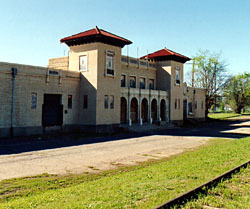 This Texas and Pacific Railway Depot is one of four remaining urban railroad stations in Louisiana. Urban stations are characterized by unique architectural design, unlike the standard railroad depots in small towns and rural areas. The depot is a two-story brick building with Italianate features. It is adorned with two towers that flank the main hall, and it has two one-story wings that frame the building. According to the building’s architect, F. G. Shaw, the building plan was chosen for its strong Spanish appearance. The beams and windows of the main waiting room were made to resemble those of the master’s cabin of the Santa Maria—Christopher Columbus’ ship. The chandeliers were modeled after the hilt of the sword worn by Natchitoches’s founder, St. Denis. At the building’s dedication in June of 1927, Shaw said that he had designed the building to honor St. Denis’s Spanish wife. The building declined with the end of the railroad boom. The station ended passenger service and eventually closed all together. Over the years, the building has deteriorated greatly, though the exterior is still intact. It is the focus of current preservation efforts by several organizations in Natchitoches, and has been recently stabilized. The depot is one of the few buildings in Natchitoches in which the architecture of segregation can be seen clearly; it originally had separate black and white entrances and waiting rooms of vastly different quality. Partially in recognition of this, one of the plans for the building is to house an African American museum once it is restored. The Texas and Pacific Railway Depot is located on Trudeau St. between 6th St. and Martin Luther King, Jr. Dr. in Natchitoches. It is currently undergoing a major rehabilitation project, and is not open to the public, but visitors are encouraged to view its façade. 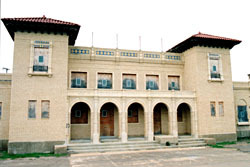 The Texas and Pacific Railway Depot has also been documented by the Historic American Buildings Survey.